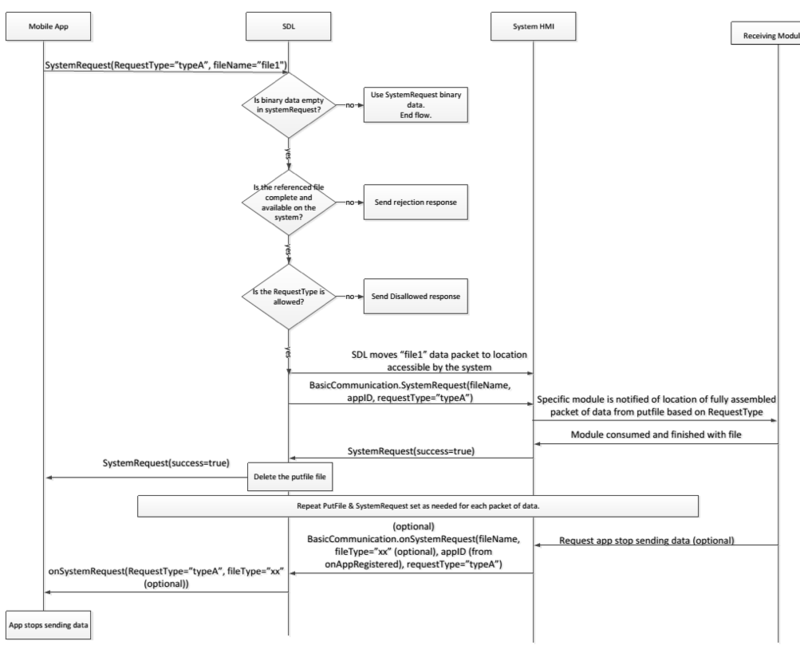 SDL sends SystemRequest to the HMI when SDL receives the SystemRequest RPC from a mobile application. Notify any relevant modules about the location of the file which was transferred. If the HMI does not respond to SDL's request within a specified timeout period (default of 10 seconds), SDL will return GENERIC_ERROR to the corresponding mobile apps request. SDL validates all SystemRequests sent from the mobile app and returns DISALLOWED if the app's system request contains a RequestType that is not allowed via Policies. SDL sends the list of RequestTypes allowed by Policies via OnAppPermissionChanged, UpdateAppList, or OnSystemRequest RPCs. If the HMI sends OnSystemRequest with a RequestType which is disallowed by the current policy table, SDL will ignore the notification. If SDL sends a SystemRequest with requestSubType parameter to an older system, it would be rejected by the system with a response of INVALID_DATA.